So blow the whole cliff-hanger why don’t you… There is a comment from Russell T that he couldn’t very well turn down a Radio Times cover, which I guess is true, but you can do it without blowing the entire climax of the episode by doing so! Anyway, aside from having the shocking revelation of the Hybrid Dalek ruined by the Radio Times, the rest of the episode was really good. The new Doctor Who stories are quite often either fairly frenetic, or fairly straightforward with their plots in order to fit into the 45 minute stories, however thanks to this being a two-part story, we at least got some better pacing, and a broader range of characters, this is apparent right from the start. The pre-credit sequence starts back-stage at a theatre in 1930’s New York, with the star of the show Tallulah with her boyfriend Laszlo. As Tallulah goes on stage to do her act, Laszlo hears strange noises coming from a store room and goes to investigate, finding a strange pig faced man who kidnaps him and takes him into the sewers. The Doctor and Martha arrive on Liberty Island. We discover later, two weeks after Laszlo’s disappearance. They find a newspaper which is reporting mysterious disappearances of people from Hooverville, the shanty town built in Central Park by people who have lost their homes as a result of the Great Depression. 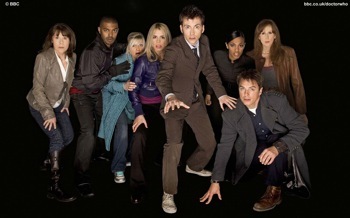 Ever one to be intrigued by a mystery, the Doctor and Martha go to investigate. Meanwhile, in the nearly finished Empire State Building, although work is continuing quickly, it’s not quick enough for the new owners of the building. Through Mr Diagoras they are trying to get the mast on the top of the tower finished by night fall – when the foreman says that it isn’t possible, the new owners of the building are revealed to be the Daleks, and the uncooperative foreman is taken away by a Dalek and two pig faced henchmen. The Daleks are in the midst of a series of experiments, and need more humans, so Mr Diagoras is despatched to Hooverville to recruit workers for a ‘job’ clearing a blockage in the sewers. Arriving at the Hooverville, Mr Diagoras recruits the Doctor and Martha along with two others, and they are sent off to find the apparent blockage. However there is no blockage, and as the Doctor starts to wonder what is really going on, the group is cornered by a group of pig faced men. All in all, the production team have done a great job of producing something that looks like New York in the thirties, all without having to do much filming outside Wales. (Although I note from the behind the scenes stuff that Phil Collinson, Helen Raynor and the effects team got a jolly to New York even if the actors didn’t!) There are also a number of impressive vistas of the city, as part of the action takes place on top of the Empire State Building itself. This is a bit of a different Dalek story for the new series too. 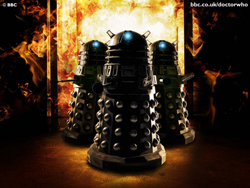 Aside from the appearance in Dalek, there have only been vast armies of Daleks. Here we have a much smaller, scheming Dalek plot. The only Daleks present are the four members of the Cult of Skaro who have managed to escape at the end of Doomsday and realising that they are alone are trying to preserve the Dalek race by a series of genetic experiments. They have also created the pig faced henchmen from the people who aren’t considered intelligent enough, in order to help them in their work. In many ways this is reminiscent of Dalek stories back in the sixties and seventies where the Daleks are a malevolent force in the background using henchmen to do much of the work. In this case, Dalek Sec believes that the purity of the Dalek race has been a hindrance, indeed one of the other Daleks in a rare moment of conversation with Mr Diagoras states that humans always survive. As a result Dalek Sec is trying to produce a Hybrid Dalek using himself as the guinea pig. Alongside the Daleks we get some nice characterisation from the other actors. 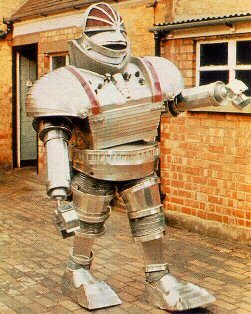 Mr Diagoras is very tough with the human workers, but at other times is obviously frightened of the Daleks, especially when he discovers that the Daleks are effectively going to reward him by killing him to become part of the Hybrid Dalek. There are also some good characters in the Hooverville with the two episode format allowing for a bit of background explanation as to what is happening. We also have the love story between Tallulah and Laszlo, with both of them joining with the Doctor in the later part of the episode. Interestingly the Doctor also actively avoids any sort of confrontation with the Daleks throughout the episode, even getting Martha to step forward to challenge them at one point rather than draw attention to himself. We also get to see his frustration in that ‘they always survive’. As with so many of the two part stories, this episode was essentially laying out the pieces for the conclusion next week. Although we got to see the Hybrid Dalek, this didn’t explain the reasons for the modifications to the mast on the top of the Empire State Building, and exactly what is going to occur that night that required it to be completed. It will also be interesting to see whether the three remaining non-hybrid Daleks survive, in an obvious way, such as the ’emergency temporal shift’ that was shown in Doomsday, or whether they’ll all be apparently wiped out. Whatever happens though, I’m sure we’ll be seeing the Daleks again – having won the recent online vote for the scariest monster and Russell T admitting on a number of occasions that they are his favourite, we’re sure to see them back whatever happens.